Since Kevin Durant left OKC, a lot has been made about Russell Westbrook and his inability to play with an elite co-star alongside him. Paul George is the exception to this assumption, as he is playing at the highest level of his career, averaging 28.7 points and 8.0 rebounds per game. FanDuel Sportsbook has taken notice of his performance and now George has the third-best odds to win NBA MVP at +900 behind James Harden (-280) and Giannis Antetokounmpo (+320). On Feb. 10 he was (+1200), Jan. 29 he was (+1900) and Jan 28 he was (+2400). 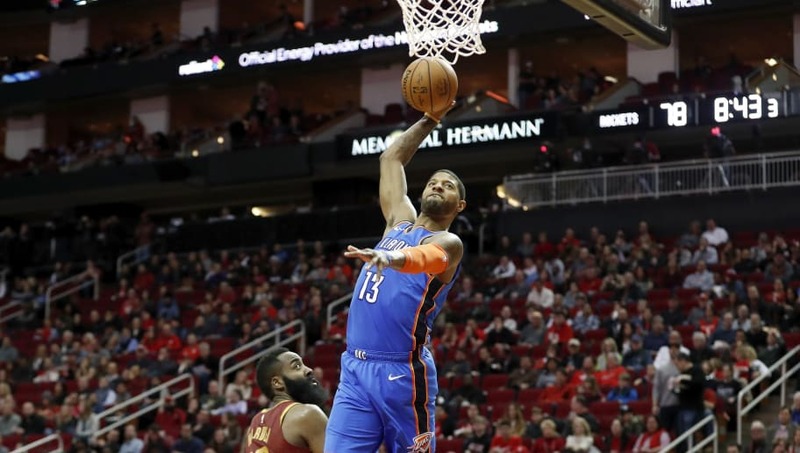 What makes PG13's recent string of success even more impressive is he's doing it while Westbrook has posted an NBA-record 10 straight triple-doubles. Last night marked the first time in NBA history that two players had a triple-double with 20 or more points from the same team in the same game. It was only the third triple-double of George's career and his first since Mar. 21, 2014. George has been outstanding over these last 12 contests, averaging 36 points. He's averaging 5.7 made 3-pointers per game and has a 3-point shooting percentage of 49.3 percent. In 10 of those games he went for at least 31 points, while three of them (including the last two games) have gone for at least 43. In addition, PG13 averages 2.4 steals per game over that span. The push for George to be MVP is probably the most real it has ever been. Glaringly, PG13's Net Rating differential is absolutely smoking what Harden and Antetokounmpo have done thus far. Thunder have a +10.0 Net Rating this season with PG on the court, -9.3 with him off. That's essentially the difference between the Warriors (+9.3) and Cavs (-10.7). According to​ FanDuel Sportsbook, OKC currently has the seventh-best odds to win the NBA Championship at +2600. If George and Westbrook continue to coexist on the same level, that might not be a bad bet either.